The New River Gorge Adventure SUP Race has become the epicenter of whitewater standup paddleboard racing in the Eastern US, but not because of a cash purse (there isn’t one!) or fantastical prizes. Instead, this race has ingrained itself in the hearts of a community that it has helped to grow since its inception in 2011. The setting itself could be attributed to the race’s popularity. The New River Gorge and Fayetteville, the adjoining mountain town, is a quintessential hub for adventure and natural beauty. Still, the underlying values and genuine love that race founder, Melanie Hames, puts into this event is the defining ingredient. The West Virginia SUP scene is filled with passionate people like her, and this event has drawn competitors from around the world that all want a piece of it. 2017 will be no different, except that an entirely new age bracket will be introduced, offering kids a chance to be more than just spectators of the event. 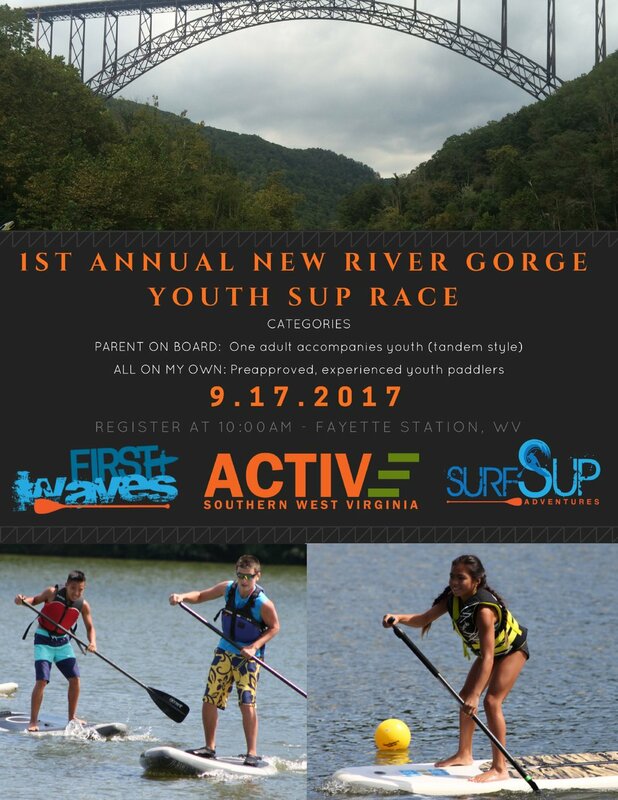 This year, First Waves has partnered up with Active Southern West Virginia to bring the first Youth SUP race to the Gorge. The youth event will consist of two categories; “All on my own,” for experienced youth paddlers to tackle the course, or “Parent on board,” where the younger paddlers are accompanied tandem style with an experienced parent or adult participant. The Youth SUP Race will be on flat water, approximately 7 minutes, wide bouy turn, and it will be water level dependent to insure a safe environment. Race Directors will discuss with parents prior to the race event or day of race event to evaluate skills and knowledge to ensure the safety of youth participants. Parent must be present while their youth is on the water. Parents are encouraged to be on the water setting safety during youth race if they would like (but not interfering in any way). Registration for the event will take place on-site on Sunday, September 17th, 2017 at 10:00am at Fayette Station, West Virginia (at the base of the NRG ‘s massive bridge!). The race will begin at approximately 12:00pmFor more information about the race, please visit: NRG RACE.